The mill and it’s several outbuildings were constructed in Kvarnviken (Mill Bay) in 1882 by snuff producer Knut Ljunglöf. The mill was built as a working mill and was very modern for its time. It was hoped to compete with the mills in Stockholm. It was driven by a waterturbine but had steam (I think) engines as reserve power. Beside the mill is a saw which could be used to cut timber. 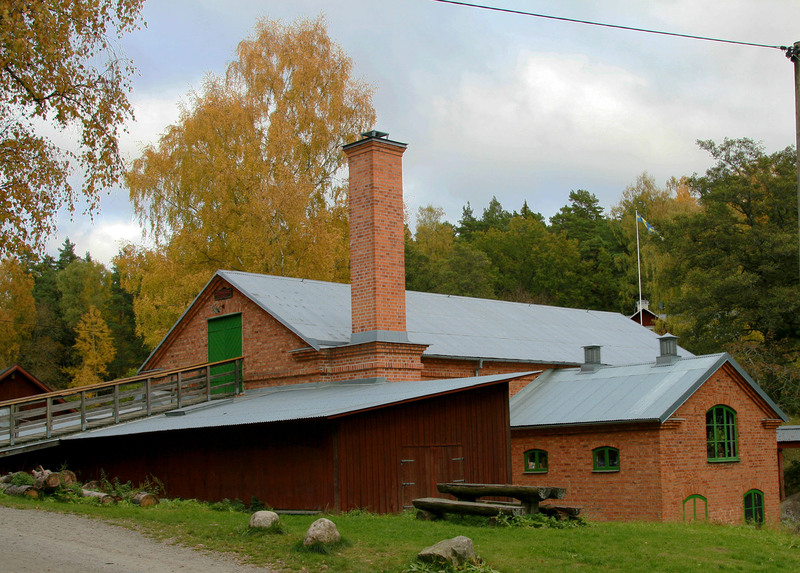 When the mill failed to become the success Ljunglöf had hopped, the mill was converted into a farm mill that served the farms in the swamp. It was finally closed in 1950. The stream that runs here has been harnessed to power mills for a long time. Already in the Middle Ages there was a mill here. There have been at least 4 small mills which were owned by various arms. An offering stone on the ridge outside a farmhouse shows there have been people in the area at least since the Viking times.